An absolute and harmonious continuity between the shapes of the backrest, seat and frame: balance and comfort. 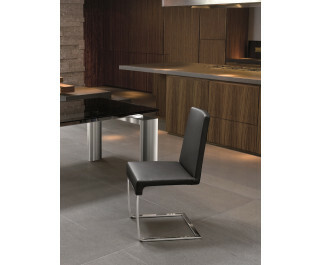 The Tag chair has a steel frame and polyurethane padding. The base is made of plate metal: chromed or painted glossy white or matt anthracite grey; the upholstery - which is available in leather, eco-leather or fabric - is fully removable.